A Kentucky Congressman says he expects President Trump to make a case for strong border security as he delivers his second State of the Union address. In a speech to a joint session of Congress on Tuesday night, Trump will likely urge Congress to pass a comprehensive border package or else watch him go it alone. A February 15 deadline threatens to close the federal government again without a border security agreement between Democrats and Republicans. The president has hinted that he’ll use the State of the Union to declare a national emergency to obtain the funding needed to build a wall on the U.S. border with Mexico. Second District U.S. Representative Brett Guthrie says he hopes it doesn’t come to that, but could support the president acting unilaterally. “If Speaker Pelosi says there’s absolutely no fencing or wall in any border security program, then the president is going to have to use the power that’s been granted to him by Congress," Guthrie told WKU Public Radio. Pelosi has called a border wall “immoral,” but several prominent Democrats have distanced themselves from Pelosi's hardline stance. Guthrie, a Bowling Green Republican, says he hopes a divided Congress can vote to support President Trump’s comprehensive package on border security that not only builds a wall, but includes money for more judges to process refugee claims and money to provide decent housing and health care for the families and unaccompanied minors crossing into the U.S.
WKU Public Radio will air NPR’s live coverage of the State of the Union address and the Democratic response on Tuesday night starting at 8:00 p.m. central, 9:00 p.m eastern time. U.S. Congressman Brett Guthrie wants to bring broadband access to more Kentuckians. He said it helps economic development as well as quality of life. About 22 percent of Kentuckians don’t have access to broadband. One of the biggest challenges with providing reliable internet access to more people is building the infrastructure. Guthrie said better access to faster internet means connecting more people to flexible work and allowing companies to remain competitive. The Democratic nominee for Kentucky’s Second Congressional District thinks the U.S. needs to consider offering amnesty to certain people who are living in the country without documentation. Hank Linderman said U.S. policymakers have to consider a wide range of solutions in dealing with the country’s estimated 12 million unauthorized immigrants. Democratic Nominee Hank Linderman toured Kentucky’s 2nd Congressional District Wednesday after winning in Tuesday’s primary. Linderman faces Republican incumbent Brett Guthrie in the November general election. Linderman made eight stops throughout the district, stopping to talk to voters. The 2nd Congressional District House seat has been under Republican control for the past 24 years. Linderman said he thinks this is the year that could change because Kentuckians are frustrated with the way the government is running, regardless of their political party affiliation. He said there’s a laundry list of things he wants to work on and improve but he wants to start by bringing people together. Kentuckians will make their way to the polls on Tuesday to vote in races up and down the ballot from the federal to local level. Turnout is expected to be on par with the 2010 and 2014 mid-term elections. About 32 percent of registered voters cast ballots in Kentucky’s 2010 mid-term election and 27 percent in the 2014 mid-terms. This year, Secretary of State Alison Lundergan Grimes is predicting turnout around 30 percent. Her office tracks absentee ballot totals as an indicator of turnout on election day. Grimes says she hopes this year’s primary bucks a recent trend of dismal participation rates. "My hope is that folks realize that our elections should be determined by a majority of our electorate and not a minority, which is what we have had in the past," Grimes told WKU Public Radio. Kentucky’s 2nd Congressional District seat has been held by Republicans for the past 24 years. Four Democrats are running for the chance to unseat incumbent Republican Brett Guthrie. One of the Democrats hoping to win Tuesday’s primary is Rane Sessions of Breckinridge County. Sessions said she decided to run for the seat because she doesn’t believe incumbent Republican Brett Guthrie represents her or her community. She works in a veterinarian office and said she’s seen first hand how hard it is to attract and keep people in that profession in rural Kentucky. President Donald Trump addressed the opioid crisis affecting the Ohio Valley region in his first State of the Union address Tuesday night. But with few specifics and little money so far to carry out the president’s plans, the public can only go off of what those in his administration have said. And that indicates an approach emphasizing law enforcement rather than funding for treatment. 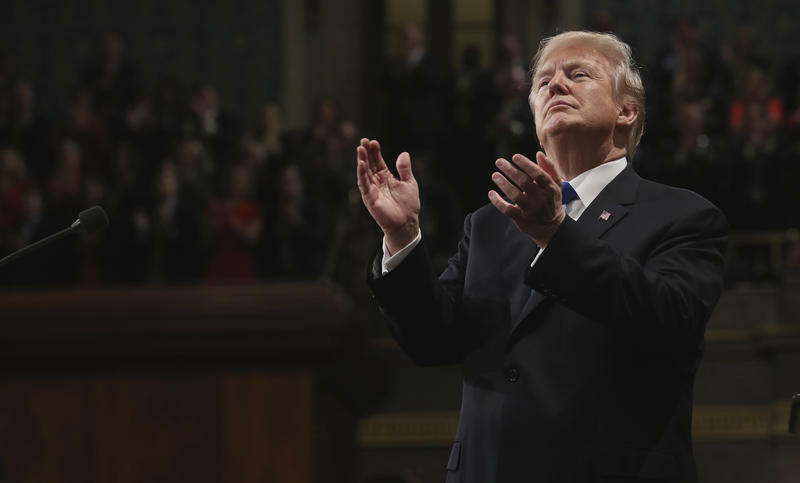 President Trump delivered one of the longest State of the Union speeches in history. Clocking in at one hour and 20 minutes, it was the third longest, behind two from President Bill Clinton in 2000 and 1995. If you missed the speech, we promise to catch you up in far less time than that (so, you're welcome). Both Kentucky Governor Steve Beshear and Tennessee Governor Bill Haslam were among the guests at the White House's state dinner honoring French president Francois Hollande Tuesday night. Beshear and his wife Jane also participated in the arrival ceremony for the French president. Beshear said it was a wonderful opportunity for the state anytime a Governor can be in the same room with so many leaders. France is the seventh-largest consumer of Kentucky products. It's the second time in recent weeks Beshear has found himself in the Washington spotlight. He was among the guests who sat with First Lady Michelle Obama at President Obama's State of the Union speech. Haslam last month blamed scheduling conflicts for missing a planned tarmac meeting with Obama when he visited a Nashville high school for a speech, but that didn't stop the Republican Governor from being among the 350 people at last night's glitzy affair. Second District Kentucky Congressman Brett Guthrie says he was hopeful President Obama would outline his plan to try to work with the House and Senate to address national problems in his State of the Union address Tuesday night. Instead, the Bowling Green Republican says, all he heard was a laundry list of priorities that, "not only cost billions of dollars in new spending, but do not address our country's core ailments."